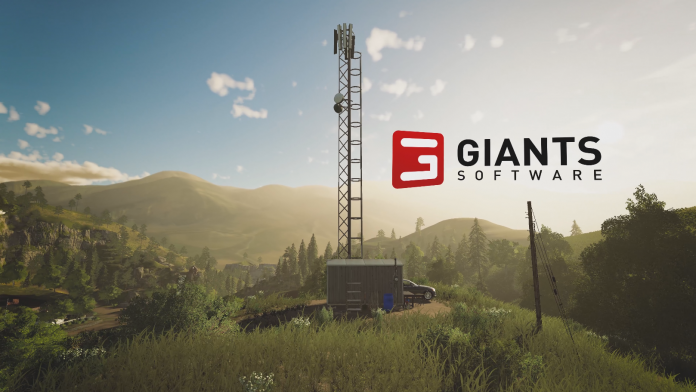 GIANTS Software certainly likes showing off Farming Simulator 19, and they’ve released yet another video giving a taste of what the game will have on offer when it launches on November 20. 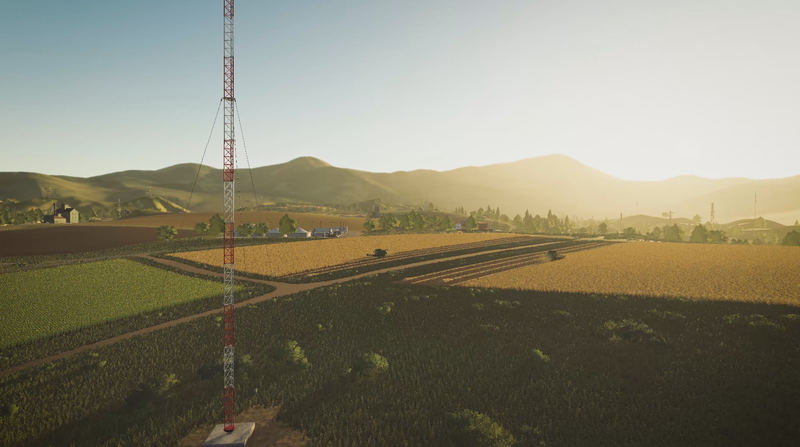 Having previously released a video tour of the all-new “Felsbrunn” map – which is based in Europe – this time, the developer is showcasing the new “Ravenport” map, which is a United States-based environment. The video “featurette” (as GIANTS has come to call these short, focused videos) gives us an overview of the map, touring a number of its landmarks and allowing us to get a feel for what GIANTS has created and what farming in this area would be like. The video alternates between showing a number of non-farming areas – such as towns, churches, and beaches – and areas filled with large fields and ample forests for players to farm to their heart’s content. It looks like GIANTS is attempting to emulate an area from the southern USA, given some of the swampy areas and other somewhat “tropical” looking locations. This would make sense, seeing as Farming Simulator 19 introduces cotton to its mix of crops, which is typically only farmed in the southern states. The top 5 states in terms of cotton production are generally Texas, Georgia, Arkansas, California, and Mississippi, but the map gives me the feeling of being in California (maybe it’s due to the visuals of the coast, or possibly the fact that it’s the only one of those 5 states that I’ve visited). Since I’m not terribly familiar with the landscape in those states it could be any one of them – nevertheless, the map definitely gives me a southern-state vibe. One thing that stuck out to me while watching the video was the presence of a house with an open door around the 00:27 mark. Not only did this house have its door open, you could see inside to see a fully modeled living room. 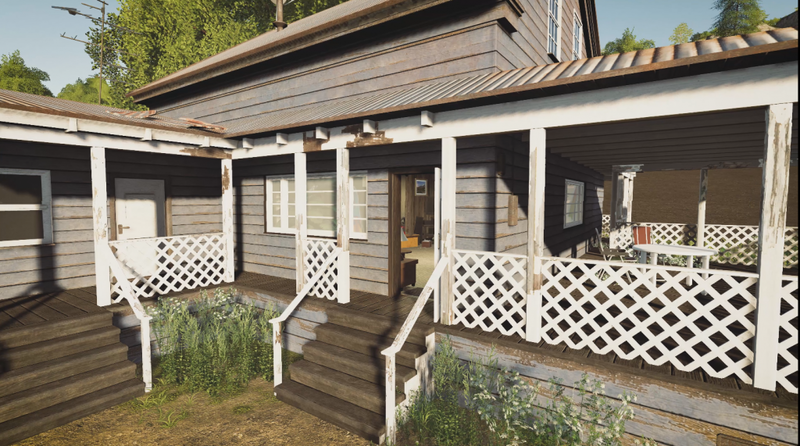 This seems to suggest that there may be locations around the map (or perhaps just this one house, which could be the player’s farmhouse) that will let you go inside. This would tie in nicely to one of Farming Simulator 19‘s new features – during GIANTS’ FarmCon conference in July 2018, the developer revealed that players would be able to skip the nights by “sleeping”. It makes sense that the player would do this by returning to their home and going inside. 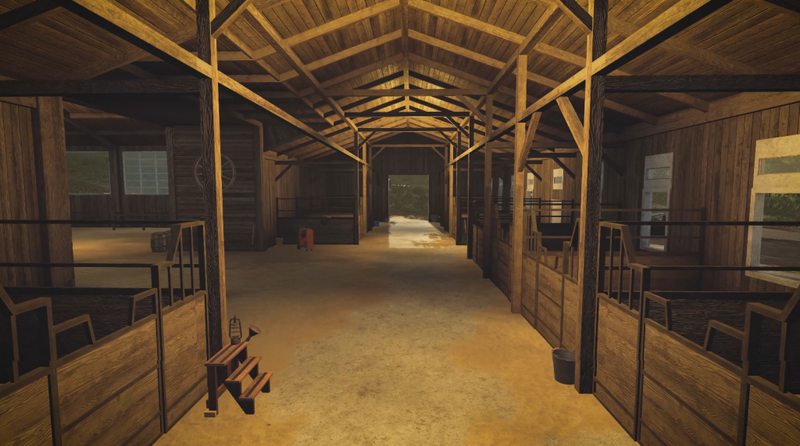 Again around the 00:52 point in the video, a clip is shown of the inside of what clearly appears to be a horse barn, as the type of stalls in the building are generally only used for horses. To me this seems to confirm that players will be able to enter certain buildings if they’re related to farm operations, as I recall GIANTS’ Community Manager Lars Malcharek previously stating that their trailers are carefully developed, and everything has a purpose. However, take this with a grain of salt as at this point it is only speculation on my behalf. The fields shown in the trailer appear to be quite large, as around the 00:44 mark we see two John Deere T560i combines working, and looking like they have substantial jobs ahead of them (despite being mid-sized combines and not the smallest in the game by any means). This is exactly what players will be looking for in a United States-based map, as the country is known for its wide open spaces – and this is usually played up by GIANTS as an intentional contrast to the smaller fields contained within its European maps. Finally, it almost goes without saying at this point, but the graphics are once again looking spectacular in this trailer. The overhauled graphical engine looks to be doing wonders for the game’s appearance, and the attention to detail in the map creation looks to be fantastic. When this is coupled with the beautiful equipment models that GIANTS is known for, the result is sure to be a stunning product. This, combined with numerous gameplay enhancements, has me incredibly excited for the game’s release. Stay tuned to Scholarly Gamers for more news on Farming Simulator 19 as we inch closer to the November 20 release date!